STS-121 mission specialist, astronaut Piers J. Sellers, translates along a truss on the International Space Station during the mission's third and final EVA. Marvellous shot - and is that a tornado among the cloud formations towards lower left? Phil a Nice Special Clear Shot. Working with NASA........ Thanks for SHARING. WOW is all I can say! Beautiful shot. They have some good cameras up at the space station! That is just cloud formations over a higher ground level, like a mountain or such, or uprising caused by an updraft. Phil, that looks scary. Do you know if they have a safety harness? Cannot see it from this angle..
NOT FAIR!! 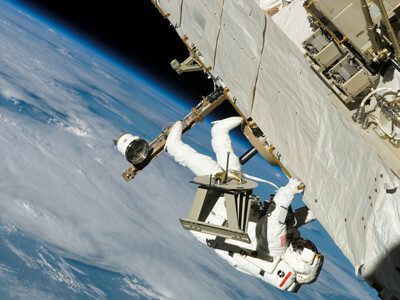 Nobody but astronauts can get these shots!! What I would do to go up there and be the photographer for the mission!!! Where do 54 year old guys with bad eyes sign up? ?